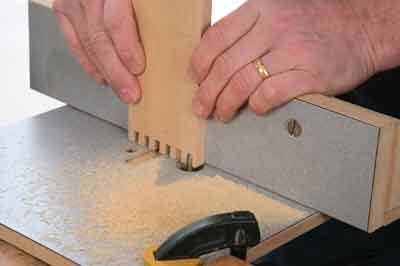 The finger or comb joint is a very strong way of joining two pieces at right angles for a box or a drawer, and the result can be quite decorative as well. 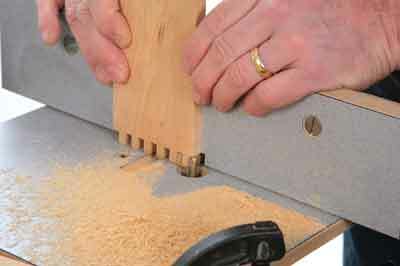 There are several ways of forming the joint but now that the use of wobble and grooving blades is illegal on a circular saw, the router is one of the best methods. 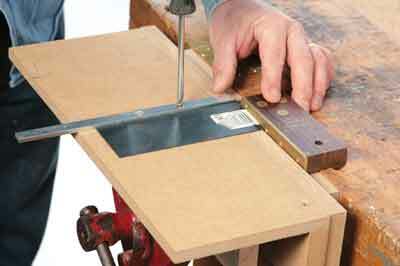 However, you will need to make a jig but this is not difficult and once you have made it you can use it time and time again on a variety of different projects. 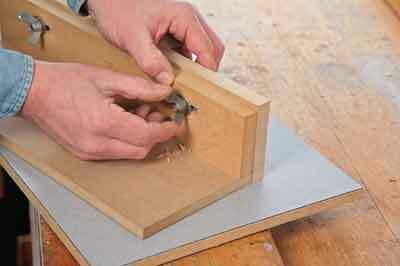 I prefer to use MDF for all my jigs - it is cheap, very stable and you can machine it to accurate shapes and sizes. 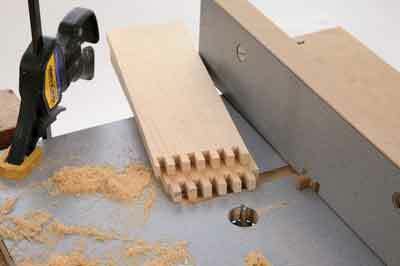 Keep all your offcuts from bigger projects for jig making - it is surprising how many of them you will use. Alternatively, use hardwood but make sure it is really dry and stable. You can just varnish the MDF on the finished jig, but my preference is to cover working surfaces with laminate. Once again anything will do, so save all those small scraps. 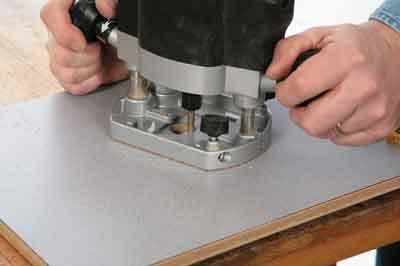 The size of this jig isn't critical but the suggested dimensions will allow you to joint material up to 150mm wide - you can vary them to suit the material you have available and the type of work you do. In addition to the MDF and laminate, you will need a strip of metal for the slide bar and a couple of 50mm bolts with wing nuts or locking knobs. 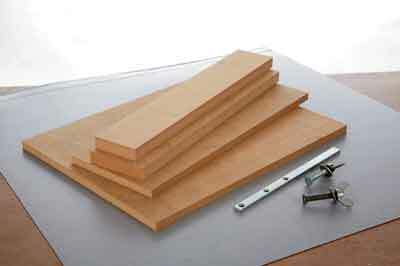 Start by cutting the components to size - they are all the same length but vary in width. 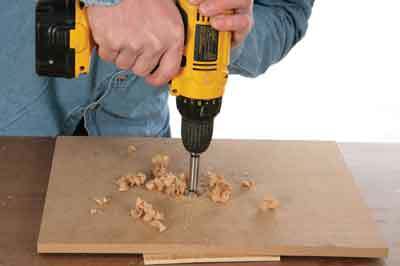 Drill a 25mm diameter hole in the baseboard at the position shown, using a sawtooth bit for a really clean cut. 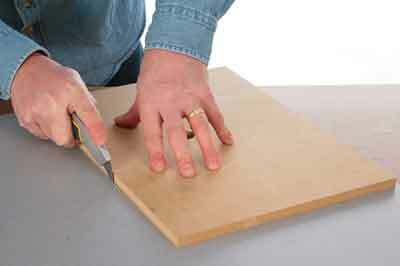 If you are going to use laminate to cover the working surfaces then cut enough to cover both faces of the baseboard, leaving them slightly oversize at this stage. The best way is to score it with a craft knife and then snap it along the line. 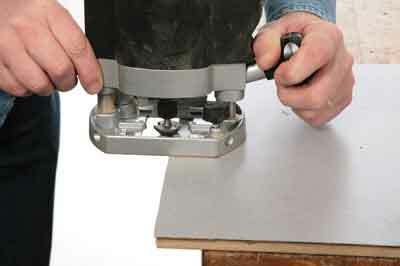 Stick it on with contact adhesive and press it down flat using a roller or a cloth, but beware of the sharp edges. Cover both faces to avoid warping. 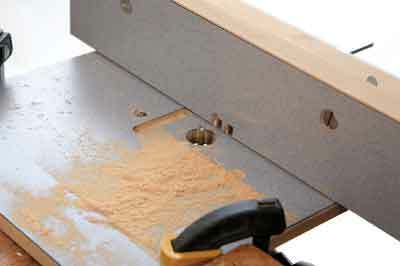 Use a laminate trimmer in the router to cut it back flush to the edge of the top. 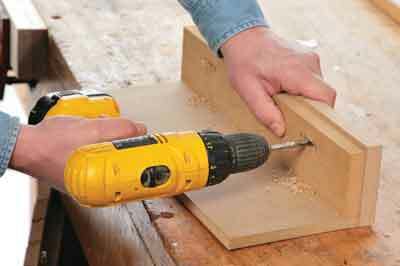 Break through the laminate covering the hole with a pierce and trim cutter and trim it back, then repeat the procedure for the fence board. The next stage is to cut the groove for the fence bar - this needs to be accurate so that the bar slides freely but without any play. 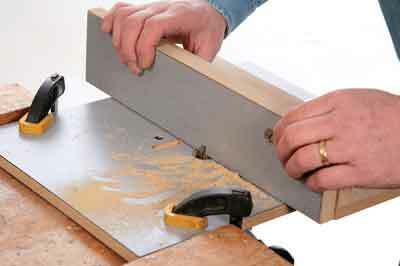 If you cannot find a suitable piece of metal you can use a strip of hardwood for this, but metal is better. 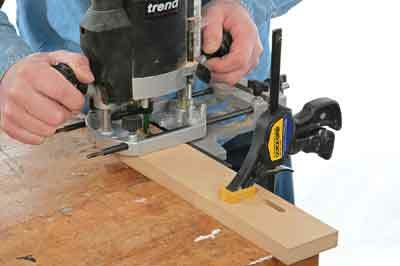 Use a suitably sized straight cutter in the router. 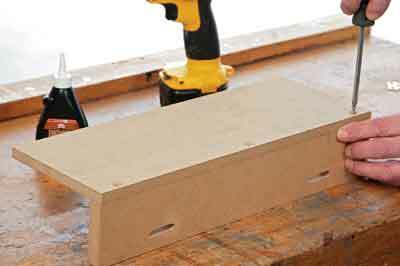 Remember to stop the groove just past the hole in the baseboard. Make sure that the groove is deep enough - the slide bar needs to end up flush or even slightly below the surface of the baseboard. 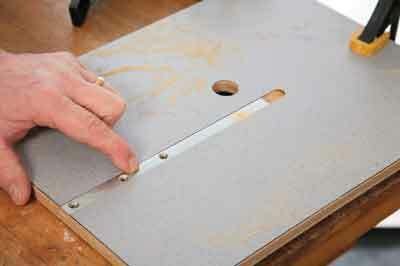 Now cut the long adjusting slots in the back fence - the slot needs to be wide enough to take the bolts. These allow you to make alterations to the position of the fence and therefore how tightly the joint fits together. Glue and screw this back fence to the sliding table. The front fence is fitted next - locate this accurately by drilling through the middle of the adjusting slot. Open the hole out to take the bolt as a tight fit and countersink it into the front face of the fence. Fit the knobs and check that the adjustment works and the fence is flat on the table. 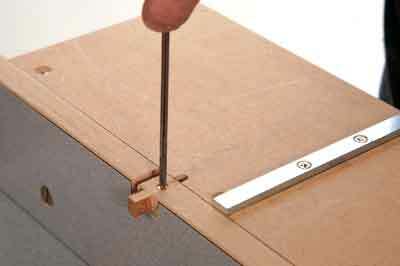 Screw the slide bar onto the underside of the sliding table using a square to get it positioned correctly. The end of the bar needs to be flush with the edge of the fence. Now you have to mount the router on the underneath of the table. Most routers have a variety of holes tapped in their bases for just such a purpose - these are usually M6. I used a false base off the router as a template to mark these holes, positioning it carefully so that the cutter would end up central in the hole of the top. 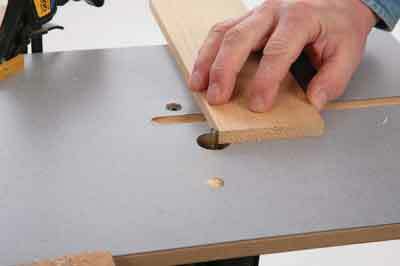 Countersink the holes from the top and fix the router in position. 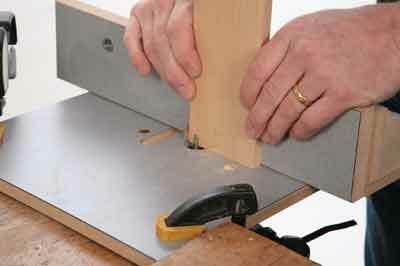 A fine height adjuster makes it much easier to set the jig to the required accuracy, and they are really useful anyway so do consider buying one. 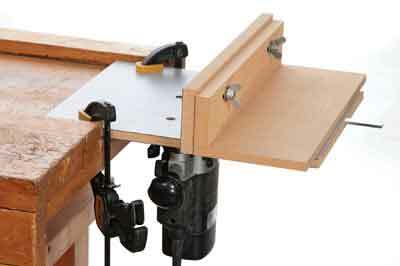 The extra overhang of the table allows you to clamp it in position on your workbench and you can quickly put it away when it is not wanted. You can use whatever size cutter you like for cutting the pins - I settled on 1/4in as this is a pretty universal size. 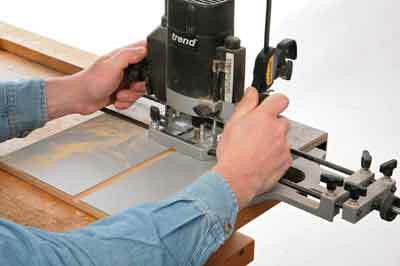 Set it to protrude about 12mm and cut a slot in the front fence by pushing it gently onto the revolving cutter. Feed it carefully as this is a deep cut for a narrow cutter. Now you need to mark out the position for the guide pin really accurately - it must be exactly 1/4in away from the first slot and then repeat the cutting procedure. 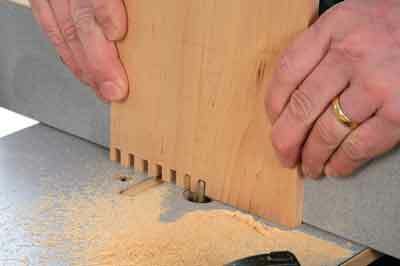 Don't worry if the laminate chips away around the slot openings. Cut a 1/4in wide pin to fit this slot, use a piece of hardwood and screw it in place so that it can be replaced at a later date as it becomes worn. 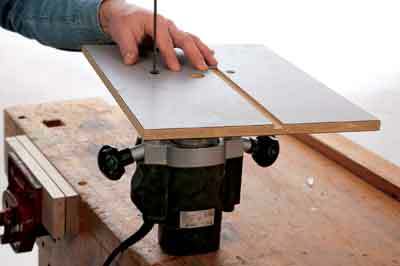 Mount the router in the jig with a 1/4in cutter and set the depth of cut to be a fraction more than the thickness of the workpiece. 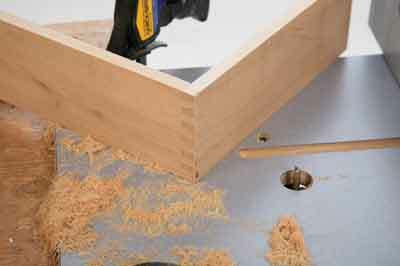 You will need to set the pin spacing by trial and error so cut a couple of extra pieces of material, making sure that the ends are straight and square. Mark them 1 and 2. 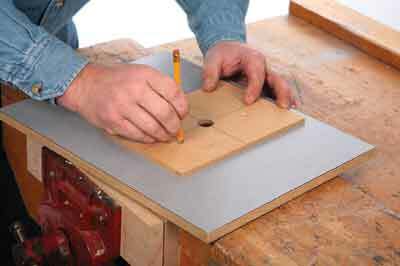 Hold the first piece vertically against the guide pin and push it gently over the cutter to cut the first slot. 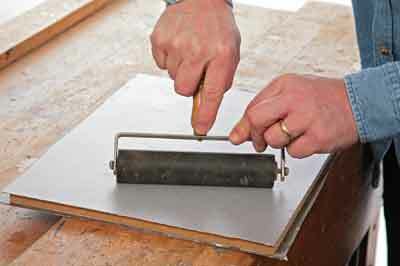 Then lift it clear of the cutter rather than drawing it back. Fit the notch you have just cut over the pin and repeat the procedure. Carry on like this until all the notches have been cut. 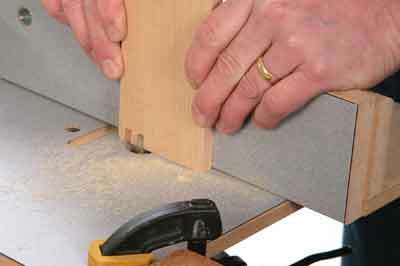 Make sure you hold the timber vertical by keeping the end flat on the table. 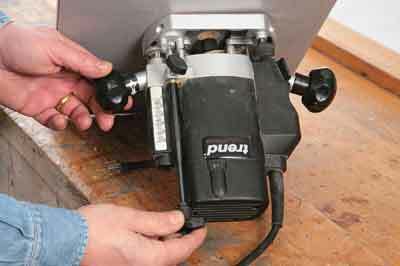 Then reverse piece 1, put the first notch over the guide pin and hold piece 2 up against it to machine the first slot. Remove piece 1 and carry on as before to complete piece 2.